Welcome to Harvest Monday, where we celebrate all things harvest related. It’s hard to believe, but it’s the last day of October and we haven’t had our first frost yet. Not only that, but it has been warmer than usual, with a high temperature yesterday over 80°F, and similar temps forecast for the next few days. That has kept the summer veggies going even as the cool season crops start coming in too. I made the first cutting of fall lettuce last week, from plants growing in a salad box in the greenhouse. I also have one whole cold frame bed of lettuce that is ready, so we should be set for salads for a while. It’s a mix of varieties in the below photo, and I do see Tall Oaks and Jester leaves among the types in the bowl. I also made cuttings from the micro greens I have growing in a window box in the greenhouse. These went in a stir fry my wife cooked up last week. I plucked a few leaves of Vivid Choi for the stir fry too. This non heading pac choi has mild, tender leaves and pinkish purple stems. From the main garden, I got a second cutting of the White Russian Kale plants. My wife braised it for a dinner side dish. The aphids are starting to multiply on the kale, but they are pretty easy to wash off on the relative smooth leaves of this kale. I will likely not spray for the aphids unless they get a whole lot worse. A good freeze will slow them down too, whenever we get one. On to the warm weather veggies now! It has been a great year for peppers here, probably one of the best I’ve ever had. Part of that is selecting varieties that do well here, and part of that is favorable weather, especially our balmy fall temps. My lone Pepperoncini plant continues to produce loads of peppers. I started out picking them when they were green and pickling them, but I quickly fell behind and many ripened on me. Then I discovered they were also tasty when pickled that way. Those in the below photo filled a quart jar, and should keep us supplied for some time to come. I also broke down and pickled a few of the Turkish cherry peppers called Sanliurfa Kiraz. These are a bit hotter and smaller than I prefer, but they were too pretty not to do something with them, and pickling was the best idea I could come up with. I’ve not canned any of these pickled peppers, so the refrigerator is starting to fill up with them! The spice peppers are still coming on as well. In the below photo, we have the paprika pepper Dulce Rojo, which I smoked and dried. This is my favorite pepper for sweet paprika. Then we have the 2015 AAS winner Flaming Flare, which is a mild Fresno type pepper that matures around 1000 on the Scoville heat scale instead of the usual 2500-10000 that most Fresno types register. These also got smoked, and I will see how they compare to the jalapenos I have smoked to make chipotle peppers. The thinner walls of Flaming Flare should dry more quickly than the smoked jalapenos, but then they will also yield less powder. I’m excited to get a decent harvest of Guajillo peppers this year. I dried all these to turn into chile powder. Last year I got a small harvest, but this year I tried a different seed source/cultivar and it did a lot better for me. I also grew Minero this year, which is a hybrid Guajillo type. I will do taste tests later between these two similar looking peppers. Minero has certainly been more productive, but I would like to compare the heat and flavor of the two. Last but not least of the pepper harvests, I got over two pounds of ripe peppers from the overwintered Malawi Piquante plant. This was the baccatum plant that was almost as tall as I am back in August, and was truly loaded with peppers. These got pickled too, using the same sweet brine I use for a lot of our peppers. I plan on digging up this plant and overwintering it inside to see if I can get a third year out of it. I have another baccatum pepper plant, Aji Angelo, that is on its third season and it is loaded with peppers too. I am waiting to harvest them and make a batch of hot sauce. But some of the best news came when I found a few more ripe slicing tomatoes. I picked two more of the red Garden Treasure tomatoes one day, and then I found a lone Captain Lucky the next. These were a very pleasant surprise for sure! This entry was posted in Harvest Monday and tagged hot peppers, kale, lettuce, micro greens, paprika, peppers, tomatoes. Bookmark the permalink. Like Sue I am amazed at your peppers and that you are able to keep track of them all. Like the color of Captain Lucky tomato, is that a fully ripe one or does it loses the green color? The Captain Lucky is ripe, and inside is green and pink. It has a sweet and tart flavor. No fair! Your harvests still look like summer! 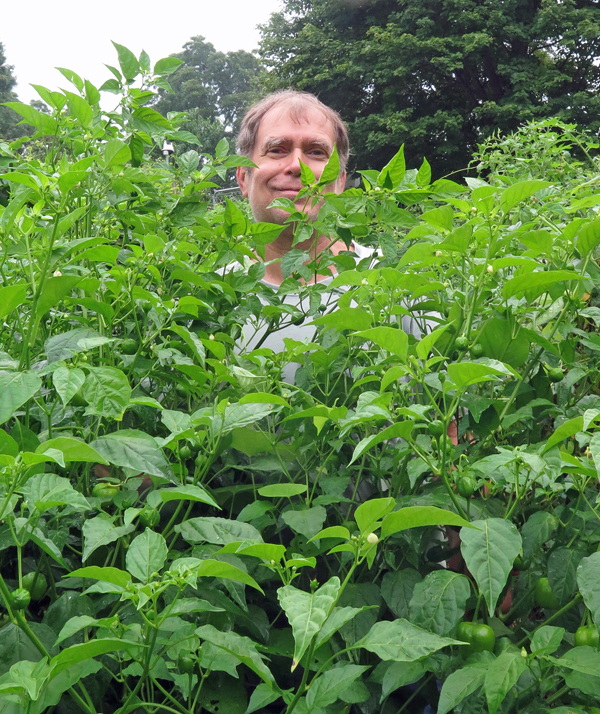 The Malawi Piquant plant is so amazingly tall and productive. Ditto Will 🙂 I’m quite envious of…well, everything! I knew what I was in for when I decided not to sow any fall veg, and now, of course, I wish I had done a bit more especially as the only one I did get in the ground – the lettuce – is still tiny. I didn’t harvest much of anything over the past week other than a few carrots but I did finally clean up the garlic as I had to get next years bed planted. Based on your advice, I’ve upped the soil amendments in the bed even more, so I’m hoping for another jump in the harvest next year. That’s an amazing late fall harvest, Dave. I’ve never even considered that a pepper plant could be a perennial here in the midwest. The Kiraz peppers look like the popular ‘cherry bomb’ pepper sold in the catalogs. Wow, you are having an incredible fall! It seems like our harvests have flip flopped. Your’s look like what mine should be in late October and mine look like what your’s might be. Wow!! Super RED! I just harvested the last of my peppers but they didn’t reach maturity so all yellowish-green. What brilliant colours you are still getting this time of the year. Lots of lovely peppers! They are one of my favorite garden veggies and I feel like I can never have enough. We’ve had warm weather and no frost here too. Some of my fall planted lettuce has decided to skip the growing part and just bolt! I’m thinking if this weather holds up I might as well plant some more lettuce seed. Some of my greenhouse lettuce also bolted. The weather is weird for sure! That’s incredible Dave. Let’s hope your perennial peppers make it another winter, wow. I have a bit of lettuce in my lean-to but it looks a tad sickly, nothing as good as yours. The claytonia is better than the lettuce so I might get a couple of harvests from that.